We were mightily impressed when Hot Toys revealed their Han Solo and Chewbacca figures, the first since they'd acquired the Star Wars license - but it might just be their next one that gets me to crumble and pick up something from them. 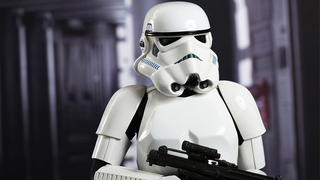 Hot Toys' Stormtrooper is here! One of Hot Toys' strengths is the incredible level of detail you get in their face sculpts - and okay, you're not getting that with a helmeted character like the Stormtrooper, but it more than makes up for it by just nailing every aspect of the figure. The helmet is spot on to the first version of the design we saw in A New Hope, the armour is gorgeously realised, and the weapons are brilliantly detailed. I've always held the Stormtrooper design in very high regard - they might be my favourite Star Wars design ever, honestly - It wasn't until Hasbro's Star Wars Black Series Stormtrooper that we really had a figure representation of the Empire's finest that did them justice, and it speaks to their quality still that it took a company like Hot Toys to best them, but for now this has to be the most beautiful Stormtrooper on the market. A second Stormtrooper, but look - HE'S A LITTLE SHORT FOR A STORMTROOPER. They did it. They did the thing. You don't just get a slightly-vertically challenged second figure (he's approximately 28cm tall, according to Hot Toys), but also a Mouse Droid and a DLT-19 Heavy Blaster rifle exclusive to the bundled pair. Shorttrooper is oddly adorable. There's no confirmed price just yet, but expect the lone trooper to set you back around $230 when they're available later next year - and closer to $400 for the two. Meanwhile, you can check out lots more Stormie goodness at Hot Toys' website, linked below.